Autumn has arrived. You can hear the wind rustling through the reds and golds of the leaves. Come and feel the wind and breathe in the earthy smells of the season on a guided walk in the Exe Valley on 4th October starting at Winsford. Learn something new at a Sea Glass Jewellery Making Workshop on the 5th October or the Stained Glass workshop 13th October – something you can then do in the darker evenings. Feeling peckish? Learn what you can and can’t eat in the hedgerows at the Fungi and Foraging walk on 8th October with an Exmoor National Park Ranger. 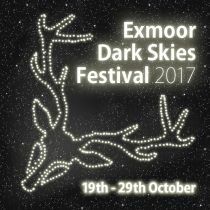 And to really experience the nights drawing in, come along to one of the many events at the Dark Skies Festival being held between 19th and 29th October. Check out the Exmoor events calendar for more great outdoor events this October.